Pollen Party is a 5 reeled game that has 720 ways to win for players to take full advantage of during the game play. In addition to its multiple ways to win, the game has other special features and bonuses that can give a lot of prizes. The game also has a pretty exciting, and an important theme. It is about the bees, one of the most important creatures in the world. Studies state that if the Bees are extinct, the human race will soon follow. This is why Microgaming has chosen this theme for its newest video slot machine to hit the market, Pollen Party. Pollen Party is a fun and a vibrant video slot machine that is lively and upbeat. The players will enter the world of the bees for a highly rewarding experience that is like none other. Players will enter the world of these wonderful creatures for a great ride. The gaming developer has chosen this theme for its latest game. The game has wonderful visuals that depict the theme of the perfectly, which is not a surprise since the game is developed by Microgaming. The game has a 5 reeled setup that host 720 ways to win for its players. The reels themselves look like the hexagons from a bee cell. The number of symbol position differs from one reel to the next. The middle reel has 5 symbols, the 2nd and the 4th reel have 4 symbols while the remaining reels have 3 symbols. The visuals of the game are of high quality, which depict the game’s theme with care. The symbols that are going to appear for the players on the reels of the game include different bees. This includes the bee guard, the bee nurse, the baby bee and the queen bee. Other symbols include the honey comb, the jelly queen symbol, and more. Pollen Party is a highly rewarding game, thanks to its 720 ways to win, as well as the special features. The first of these special features is the wild icon. Like any wild, the symbol will be able to stand in for the other icons appearing on the reels to help the players form the best prize possible. The game does not have one wild only, but three wilds. These three wilds are the golden honey WILD, the Pollen Party logo and the golden flower. These icons will not replace the other special icons that the game has, which is the Scatter and the Bonus icons. 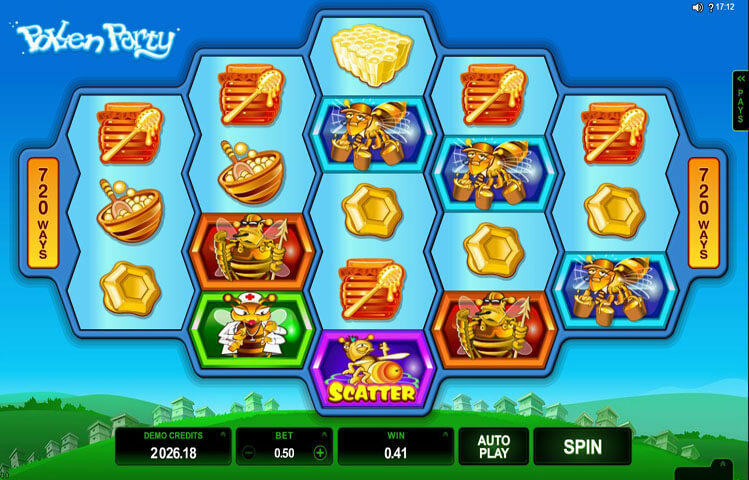 The scatter bee can give out scatter prizes, in addition to the free spins round. Players will need 3 scatters to claim 12 free games. As for the Bonus icon, it can trigger the Babee Bonus when 3 of them land on the reels.